NOTICE: Have you checked to confirm that you’re allowed to run a fundraising campaign for your Catholic charity, religious order, cause, or parish? Catholic bishops, particularly in the US, have strict guidelines about who can run a campaign. Meaning, you may have to stop before you even consider starting to fundraise. When it comes to fundraising, we all want to follow the right protocol to make sure that people (especially bishops) understand that the money raised is going to a great cause. Can. 1262 – The faithful are to give support to the Church by responding to appeals and according to the norms issued by the conference of bishops. However, this decree doesn’t apply to everyone. We all have come across causes that call themselves Catholic but, if you look carefully, they are, in fact, not. Rather, they use the label to attract the attention of Catholics but — intentionally or not — distort Church teaching and use the funds raised towards unorthodox views. To keep our Catholic brand safe and authentic, the United States Conference of Catholic Bishops provides guidelines on how to comply with Canon law. These guidelines protect those who do follow Church teaching and allow them to succeed in raising funds for their mission. 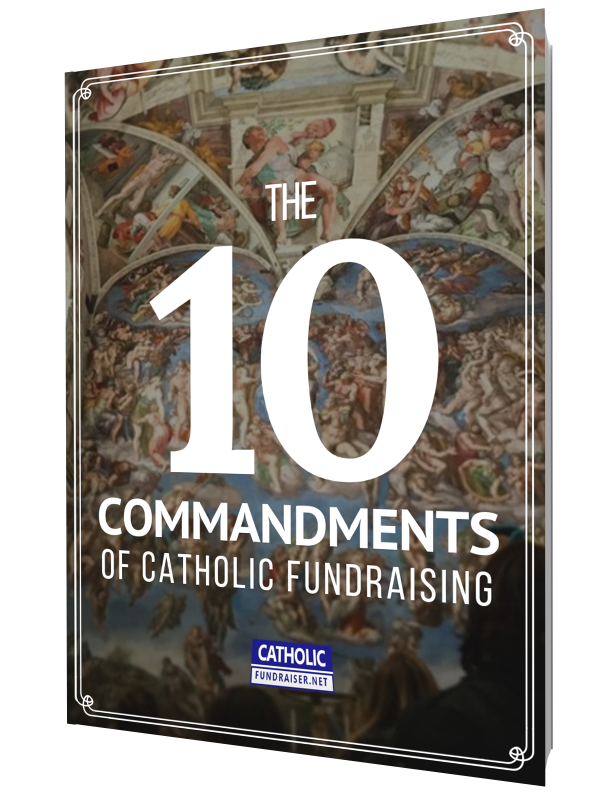 While the bishops don’t offer recommendations on how to find donors or what to say when asking, they do provide four helpful guidelines for achieving long-term fundraising success for your Catholic cause. Institutes of consecrated life and societies of apostolic life require the approval of the major superiors and the diocesan bishop to solicit funds. Diocesan entities require the approval of the diocesan bishop to solicit funds. Other Catholic entities and organizations also require the approval of the diocesan bishop to solicit funds. The bishops require that fundraising appeals be truthful, theologically sound, and strive to motivate the faithful to a greater love of God and their neighbors. You are also not to make agreements which directly or indirectly base payment either to a commercial firm or to a religious fundraiser on a percentage basis. Additional Resource: I’ve written an article that will help get you organize your appeal correctly, especially when you use Biblical quotes. You can read my article by clicking this link, Killing the Bible Softly with Your Appeals. Fundraising efforts are to be for defined needs, hence the importance of having a case for support that clearly outlines why you are fundraising and what the money will be used for. Also, funds collected must be used for their intended purposes and not absorbed by excessive fundraising costs. As we saw in guideline #2, this maintains your relationship of trust between donor and fundraiser. Additional Resource: You can learn the fundamentals of writing a case for support by reading this article on how a priest raised nearly $2 million, 5 steps from Fr Marcus on how to restore your church or parish. You are recommended to make fundraising reports available to benefactors on a regular basis. The bishops require that you inform donors regarding the use of donated funds and assure them that any restrictions on the use of those funds will be honored. Additionally, the bishops ask that you submit periodic reports to your local Catholic authority on your fundraising programs and the activities they are supporting. I advocate for continuous communication throughout the year. In my view, it’s not enough to simply send an annual report because that is not building year-round visibility, trust, and interest in the great work that you are doing. Additional Resource: Dig deeper into this subject by reading my article, What to Say When Fundraising. You can read the full text from the American bishops on the United States Catholic Bishops website. While at times cumbersome, these Canon law guidelines exist to protect us all from abusive Catholic organizations and help us by offering the blessings and support of our bishops when we run our campaigns. It may be difficult to get the attention of your bishop to sign off on your campaign, but it’s worth the patience. The approval of your bishop – or local Catholic authority – will encourage you to keep moving forward in the long-term because you’ve surmounted this hurdle and gathered their support. Plus, even if you have to wait to get approval, I always encourage Catholics to jumpstart their mission outside of fundraising. We don’t necessarily need funds to our mission off the ground. I do believe that God will always provide, so let Him manage the fundraising. You’ll be amazed how generous people are when they see you doing great work while not asking for funds. So keep moving forward and as you pick up speed and prepare for your next campaign, notify your local Catholic authority of the great work you are doing in the community. Inspired by your charity for others, I’m sure they’ll offer their blessing sooner than you think. Question: What steps have you taken to notify your local Catholic authority about your fundraising? You can leave a comment by clicking here.